Louis Marie Baptiste Atthalin’s marvellous set of transformation cards, known in France as “cartes comiques”, was first published in c.1817. 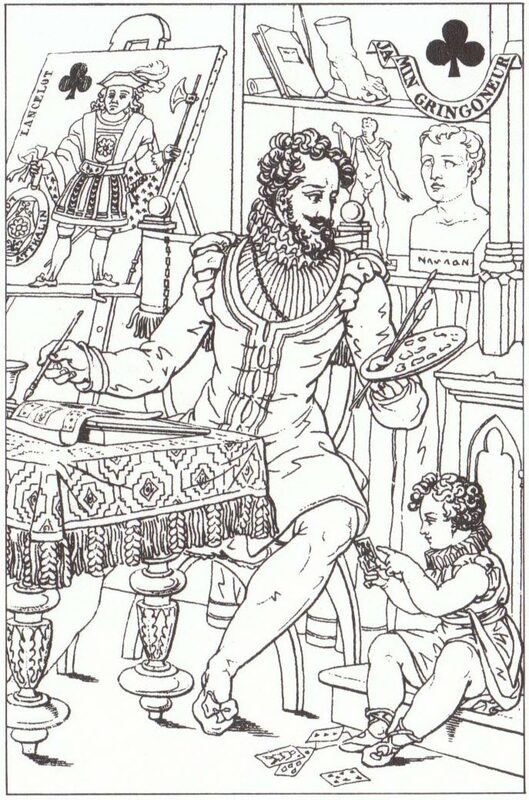 The court cards are titled and depict persons from classical literature and history in a scene relating to their life, whereas the numeral cards are untitled and portray a variety of contemporary scenes or imaginary cartoons in extraordinary detail (bearing in mind the constrained size of a playing card) and which transform the humble playing card into fine art. The scenes on the numeral cards include: soldiers, musical gatherings, farm workers, street performers, nursery scene, sailors' sleeping berth, dancers, boxers, doctor's patients, a caged bear, pipe-smoking arabs, a sedan chair, an alchemist and various allegorical scenes. Besides being an accomplished artist, watercolourist and lithographer, Baron Louis Atthalin was a French Army officer who received numerous awards and distinctions during his military career, reaching the rank of Lieutenant General. In addition, Atthalin was a Knight in the Royal and Military Order of Saint Louis, a Grand Cross in the Royal and Military Order of Saint Ferdinand, and awarded the Order of Glory. In 1848 he retired to Alsace and devoted the rest of his life to watercolour painting. The court cards, as is often the case with standard French cards, are titled and represent persons from classical literature and history. But in Louis Atthalin's version they appear in a scene relating to their life history. 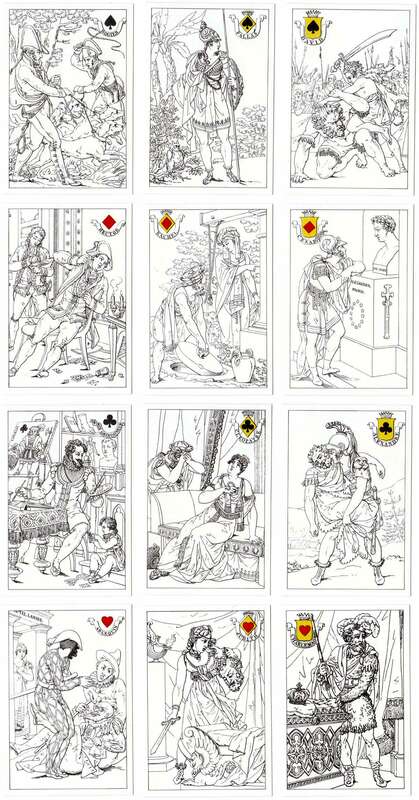 Above: cards from a reproduction of an original deck in the National Playing Card Museum, Turnhout (Belgium) published in 1996. All images courtesy Rex Pitts.